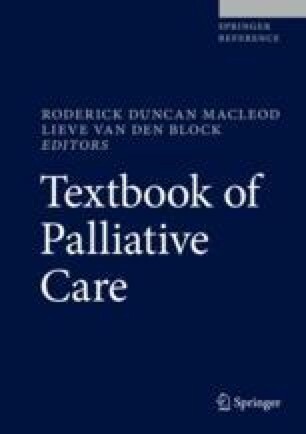 This chapter has an intentionally broad title to convey the breadth of ways that arts (with an emphasis on visual arts but also performative, poetic, tactile, and narrative art forms) contribute to whole-person wellness, hope, and engagement, across a range of stages encountered in palliative care services. This chapter looks at participatory arts, community and creative art facilitation, and art therapy. While there is considerable overlap in the utility of art and its benefits, such as creative enabling and expression for the patient, the range of approaches to art in palliative care herald from different disciplines, with different objectives, and are usually practised by people with distinctive professional backgrounds. It will also be clear that aspects of art facilitation in palliative care overlap substantially with approaches found in mental healthcare, dementia care, aged care, rehabilitation, and wellness initiatives in the general population. Specific to palliative care are the needs of the individual patient. Arts in palliative care now cross a range of settings, from hospital or hospice to residential care homes and community settings, variously with a dedicated studio space or a relatively mobile setup provided by the practitioner in any venue, even at the bedside. There is also some degree of nexus between arts in palliative care discussed here and psychotherapy and psychoanalysis, music engagement, “social clubs,” and initiatives for art appreciation offered by art organizations, galleries, or museums and community-run art-making courses. However, this chapter focuses on the art experience tailored to people with palliative care needs. Footscray Community Arts Centre. 2013. http://footscrayarts.com. Accessed 20 Mar 2018. HammondCare. 2016. Arts on prescription. http://www.hammond.com.au/health-and-aged-care/arts-on-prescription. Accessed 20 Mar 2018. Rosetta Life. 2007. http://rosettalife.org/. Accessed 14 Mar 2018.